Atlanta – June 25 2012 – Qoppa Software, a leading provider of PDF solutions, announced it has integrated its Android PDF editing app, qPDF Notes, with Box OneCloud to power mobile document collaboration and productivity. 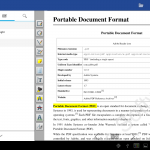 qPDF Notes’ integration with Box helps millions of individuals and companies easily work from their Android tablets and smartphones on forms, drawings, contracts, and other PDF files managed on Box OneCloud. Once editing is finished, documents can be saved straight back to Box with a single tap. The integration is transparent to users and makes editing PDF files stored in the cloud as simple as editing local files. “This collaboration between Qoppa and Box is a big step to improve document handling on the go. PDF is the de facto electronic collaboration format on mobile devices where editing has to be easy, graphical, and intuitive. The great thing with the PDF format is that annotations are saved as part of the document itself and thus can be viewed by any recipient on any capable PDF viewer.” says Gerald Holmann, president of Qoppa Software. PDF documents are an integral part of business workflow today and qPDF Notes is used by companies and professionals in various industries including architects, contractors, educators as well as real estate and medical professionals. 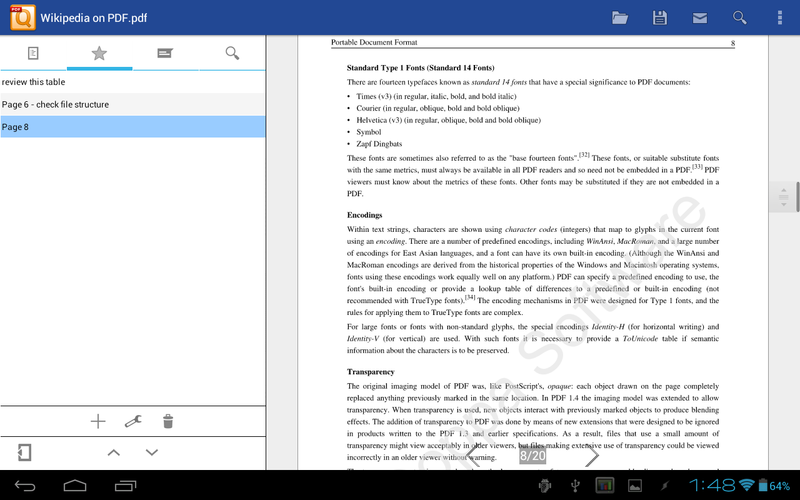 To celebrate qPDF Notes’ one year anniversary and the Box OneCloud integration, the app is offered at 70% off through June. Users who are currently evaluating qPDF Notes Demo are encouraged to take advantage of this opportunity to upgrade to qPDF Notes Full Version. Qoppa Software specializes in the development of high-end libraries and applications to work with PDF documents. Qoppa Software offers a suite of highly portable products that cover every aspect of PDF processes and integrate seamlessly into document work flows, including end-user, server and PDF library products. Qoppa’s products are carefully designed to provide the highest level of performance and reliability. 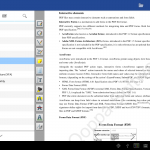 This entry was posted in Android PDF and tagged Android, Box OneCloud, PDF, Qoppa Software, qPDF Notes on June 25, 2012 by qoppacom. qPDF Notes 70% off through June! 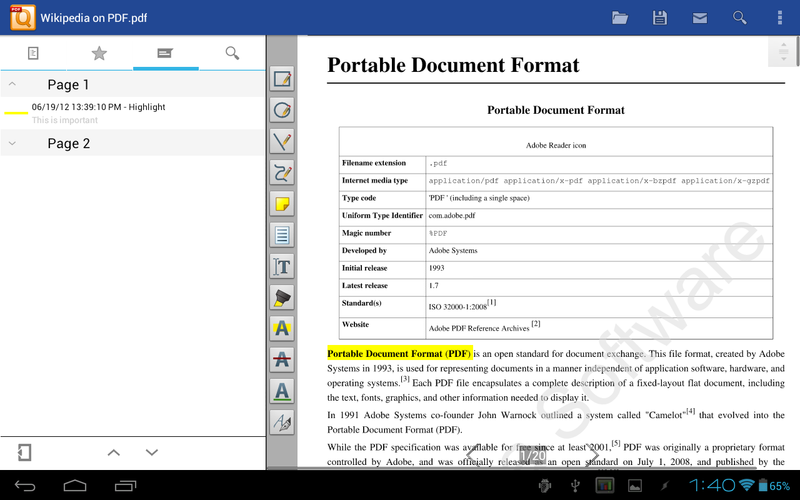 ATLANTA – June 20, 2012 – Qoppa Software, a leading producer of PDF solutions, celebrates the 1 year anniversary of their Android PDF apps with new release 2.4 of both qPDF Viewer and qPDF Notes; and by extending a 70% discount on the paid qPDF Notes app for a limited time. “As Android users continue to elect Qoppa’s qPDF apps as their favorite eBook readers and business tools, we are delighted to respond with additional UI improvements to make the experience even more intuitive and complete.” says Leila Holmann, Qoppa’s Vice President. Outline / Document Bookmarks: Navigate through the outline / table of contents. The outline presents itself as a collapsible tree, usually created by the document publisher, and often contains a bookmark for each section within the document. 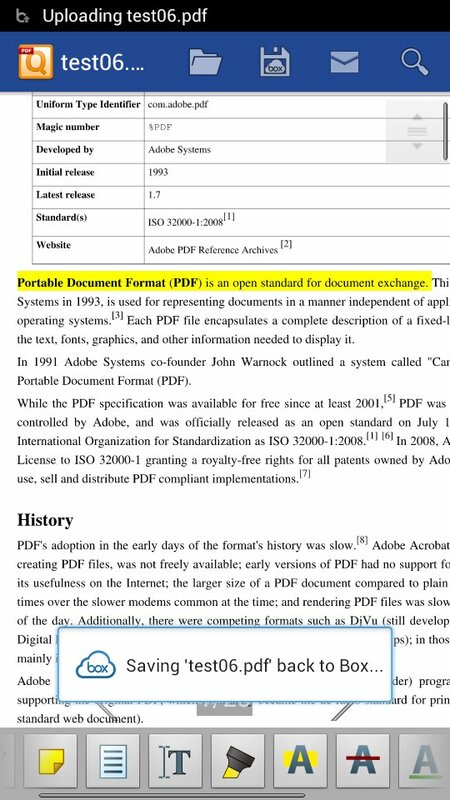 The outline is stored inside the PDF document itself. User Bookmarks: Users may create personal bookmarks to mark preferred passages at specific page / magnification inside a document. User bookmarks are stored on the device and will remain even after reinstallation of the app. Annotations List: See the list of annotations / comments (ordered by page) that were added to the PDF document. 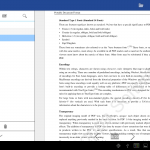 Tap on an annotation to jump to it in the document. Text Search (tablets only): Search for a string in the document and see all the search results in a scrollable list. Easily jump to a given occurrence of the string in the document. 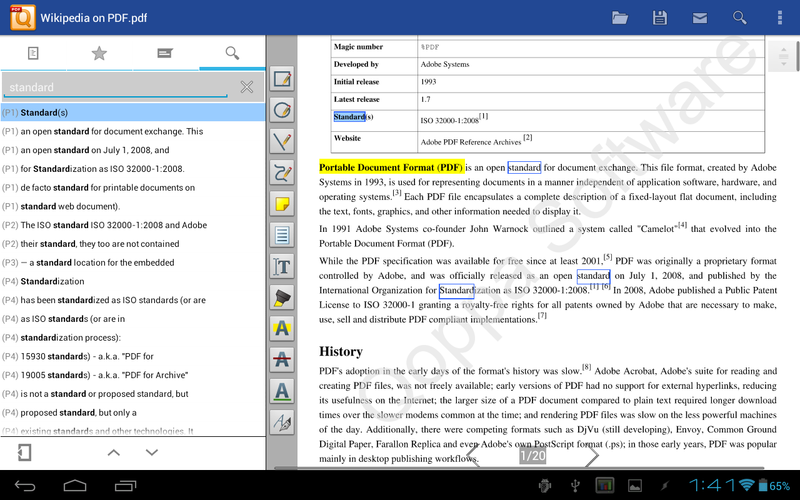 qPDF apps version 2.4 now remember the last page read in a document. Upon reopening any previously read document, the last position is restored. This feature is expected to delight existing users who have elected qPDF as their everyday reader. A new, user-friendly free-hand highlighter tool lets users highlight areas in documents with the tip of a finger as if using a marker. This tool works on all documents including scanned images which do not contain any text. It is very easy to use and may become a favorite for users on smaller screens. 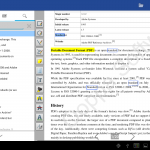 To celebrate qPDF Notes’ one year anniversary, the app is offered at 70% off through June. Users who are currently evaluating qPDF Notes Demo are encouraged to take advantage of this opportunity to upgrade to qPDF Notes Full Version. 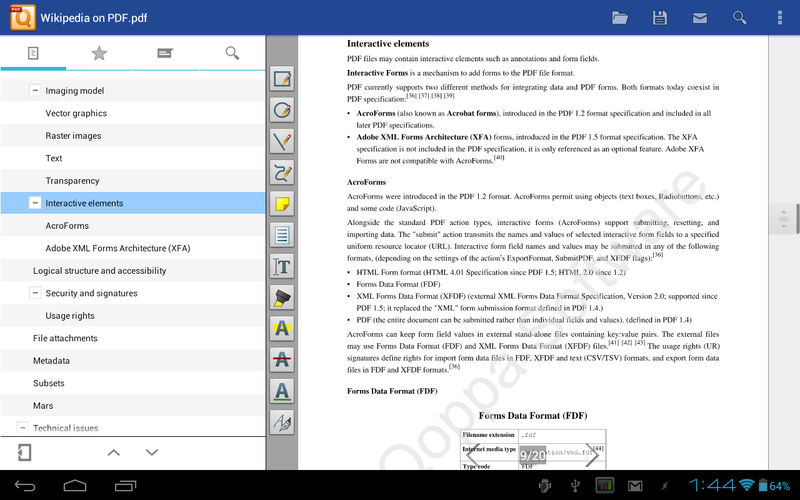 Qoppa Software also makes its Android PDF technology available in qPDF Toolkit for Android developers to integrate PDF features into their own apps. Qoppa’s Android products are available for all Android phones and tablets 2.1 or higher including: Asus Transformer Prime, Acer Iconia, Samsung Galaxy Tab, Samsung Galaxy Note, Motorola XOOM, Lenovo Thinkpad, Kindle Fire, Nook Color, Sony Xperia, devices with custom ROMs, and the Blackberry Playbook. This entry was posted in Java PDF Library and tagged Android, Android apps, apps, bookmarks, PDF, Qoppa Software, qPDF Notes on June 20, 2012 by qoppacom.